This project aims to bring together a varied collection of information about the Regiment. These pages will attempt to combine information about the Regiment's battalions making it easier to navigate and find more specific information. Each battalion has its own page and each subsequent section is broken down further, again with their own pages, subsections and so on. Much of the information contained within these pages have been sourced from one invaluable reference, The Border Regiment in the Great War by Colonel H.C. Wylly, C.B. Colonel Wylly, not only a respected Colonel but also an author, has written a seminal piece of work, a record of the history of the regiment during the First World War with great detail and accuracy. It might not be everyone's favourite piece of literature, and at times it can be a strain to read, but that aside, this single study is the definitive source for the history of the regiment during the 1914-1918 period and should be regarded as such. Colonel Wylly was thanked for his efforts by Major General Sinclair MacLagan in the preface of 1924 for the "skillful manner in which he has recorded the doings of the different Battalions in six separate theatres of war, and has merged them into one consecutive narrative - a task which at first sight appeared well nigh impossible". Yet Wylly achieved this with great success owing to the style in which he decided to write; keeping the regimental units together instead of separating them into their individual battalions. Sinclair MacLagan explained stating that "The Border Regiment, in both peace and war, exists not as a collection of separate units, but as one large family irrespective of the number of Battalion embodied in it", which makes sense as to why Colonel Wylly chose to write the narrative in a linear format for all of the Battalions. Firstly, as a personal souvenir for those who fought with the Regiment to enable them to recall to the mind the part which they and their comrades played in assisting to bring about the great victory. These reasons alone would have helped many people understand what happened on the battlefields as their fathers and sons, uncles and nephews fought on foreign soil for something much larger than their own individual needs. It is true that many men signed up to escape the monotony of their daily lives with the prospect of a decent wage and meals three times a day; others left their respected jobs, lifestyles and families behind. Whatever the reason, little did they know that such a large number of men from both Cumberland and Westmorland would not be returning home again, totally devasting the male population in small rural communities. It is hoped that many questions were answered, particularly for those who suffered losses without explanation as to what happened to their sons. How truthful Colonel Wylly's rendition of the facts in his telling of them is somewhat unsure but if people were looking for answers, they would have found some peace, a sense of closure, contained within those pages. 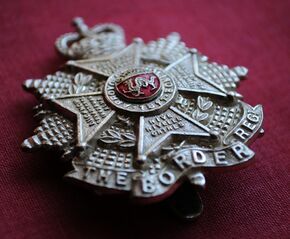 The Border Regiment during World War One is an interesting story to tell. They fought in 6 Theatres of War, 18 Operations and 68 Battles between 1914 and 1918. They, like any other Regiment, fought well and did their part for the freedom of others. As with any history, particularly a military one, there are going to be many different layers to contend with; layers that involve deep and detailed historical and political fact, something out of scope for the purpose of this site. The message here is not to say "this is what happened and why" or "what would have happened if...." or even "whose to blame for the deaths of so many men?". These discussions are best left to those who have a greater knowledge of historical and political fact based on years of experience in their chosen field of study. This site is more about simply touching upon the basic layers giving an idea of what the Border Regiment during World War One was about; a simpler view assisted with the words of Colonel Wylly. The Border Regiment was made up of men from all walks of life. The brutalities of war brought about a challenge of mental and physical undertakings, not only for the ordinary fighting men but also those who were leading them. It is undeniable that during the course of the war mistakes were made. Deaths were inevitable and large numbers could have been easily prevented yet even with such terrible and futile losses. Those that did survive lived with the knowledge of the awful realities of war, some never speaking of them ever again. But the facts remain; nothing can change what has already been done. The Border Regiment's part in history is just a small, yet significant, element that makes up 'the whole'. The men did what they could along with everything else that was accomplished in the fight for freedom. Even with such high costs, the fight for freedom was the right thing to do. "The devoted and firm conduct of this Battalion repeatedly called forth the admiration of the Brigadier and of officers in other battalions in the same brigade; and I, myself, can testify to its fortitude and determination to maintain its position at all cost; a spirit which saved a difficult and critical situation. It is impossible to praise this Battalion too highly for its firmness and battle discipline". Message received from Divisional Commander, 7th Division, praising the 2nd Battalion Border Regiment. The history of The Border Regiment, like many other regiments from this period, is a long and complex one that is far too detailed for me to go into here. There is much research needed and even though the number of original documents housed in archives are numerous, particularly those of Lord Lonsdale's 11th Battalion at the Castle in Carlisle, the actual number of obtainable and useable documents online are very slim, and those that can be accessed are usually at a price. The number of sources used have been kept to a minimum and so with this in mind please be aware that the following history of the Regiment does not take on an argumentative view combining different academic sources to produce one factually based text; instead, this history, simple and honest in nature, will be the starting point for The Border Regiment during World War One on these pages, aided with texts written by Colonel Wylly. The history of the Border Regiment is interesting to say the least. The earliest known incarnation of the modern-day Regiment dates as far back as 1680 when Charles FitzCharles, 1st Earl of Plymouth, raised the 2nd Tangier Regiment (which was part of the British Army). Over a period of time the regiment was to become the 4th (King's Own) Regiment of Foot but it wasn't until the mid 1700s that more changes for the regiment were on the horizon. In 1705 the 34th (Cumberland) Regiment of Foot was formed and fifty years later in 1755 the 55th (Westmorland) Regiment of Foot was also formed. These two regiments from the Northern Counties of England were later amalgamated in 1881 to form The Border Regiment, the proud fighting force of World War One and Two. This amalgamation was part of the reformation of the British Army, known as the Childers Reform, at the time. In 1881 the 34th and 55th Regiments of Foot no longer existed. In 1959 the regiment was yet again amalgamted to form the King's Own Royal Border Regiment, keeping the same traditons of it previous forebears, the 4th, 34th and 55th Regiments of Foot. A common misconception is that Britain was not ready to go to war in 1914. This is only true in part and understanding how the First World War started in the first place gives an idea to the run-up of Britain playing its part in the grander scheme of things. The British Army throughout its long history has continually changed, many of these manifestations bringing about new challenges. What the Central Powers had thrown upon Britain was something of learning curve, which brought about more changes to accommodate what was to become over the next five years. The Regular Army had gained a vast amount of experience in the colonies, however, with all this experience, the Army’s main weaknesses were the insufficient numbers. What was required of the army could not be possible given the stretch incurred by so little manpower. Britain’s army had not needed in the past to be so great but for the coming months, large numbers of men would be needed for such an impossible task of breaking the German advance across France and Flanders. Reinforcements came by way of drafts from the Militia, Yeomanry and Volunteers as well as by overseas contingents from the Dominions and Colonies. Realisation of what needed to be done came about shortly after the turn of the century. The British Military underwent some drastic changes that saw the abolishment of the office of Commander-in-Chief and the creation of a newly-formed Army Council. The Regular Army was organised to become the British Expeditionary Force, consisting of six divisions, each of three infantry brigades and one cavalry division, each of the six divisions totaling 18,000 men of all ranks. This restructuring also saw the Yeomanry becoming the second line of cavalry, which was organised into 14 brigades, and the Volunteers becoming the Territorial Force, grouped into 14 divisions and organised much the same way as the Regular Army. The Special Reserve’s (formerly the Militia) purpose of being was nothing more than to supply the army in a time of war. The change in Britain’s armed forces continued with improved mobilisation and training, which was key to her natural development. As time pressed on, according to the Official History of the War the overall result was that "in every respect the Expeditionary Force of 1914 was incomparably the best trained, best organised and best equipped British Army that ever went forth to war. Except in the matter of co-operation between aeroplanes and artillery, and use of machine guns, its training would stand comparison in all respects with that of the Germans. Where it fell short of our enemies was first and foremost in numbers; so that, though not ‘contemptible’, it was almost negligible in comparison with Continental armies even of smaller states". The Border Regiment at this time when the war commenced was only five battalions in strength; 2 Regular, 1 Special Reserve and 2 Territorial. The 1st Battalion was stationed in Burma, the 2nd was quartered at Pembroke Dock, the 3rd and 4th Battalions had their headquarters in Carlisle and the 5th at Workington. It comes as no surprise that The Border Regiment before the war was different to that of the Regiment during and also after the war. As with every other regiment of the British Army, The Border Regiment expanded considerably in size as the war the progressed. The call for men was never greater when the awful realisation that the numbers were far too short to cope with the invading German force, even at such an early stage. The Border Regiment, seemingly small to other much larger regiments, was engaged in war from the very beginning but only in the form of the 2nd and 5th Battalions, on which this initial history is based. The 2nd Battalion was still encamped at Lyndhurst when another 64 reservists joined the ranks. On the 4th October, 1914, orders came through to march from the camp to Southampton, a fair walk by an means. The men were split into two parties, the first consisting of Headquarters, ‘A’ and ‘B’ Companies and the second consisting of the remainder of the battalion under the command of Lieutenant-Colonel L. I. Wood and Major J. T. I. Bosanquet respectively. The first party set off at 10.15pm, the second following behind exactly half an hour later. Dockland sheds were the accommodation for the evening on arriving at Southampton; a building with a roof being better than the open air on the chilly October night, provided the shelter they needed whilst resting. The next day, the 5th, saw the embarkation of the Battalion. Colonel Wood’s part left in the Turkoman and Major Bosanquet in the Minneapolis along with the Headquarters of the 7th Division. At time of sailing the 2nd Battalion’s strength was thus: 30 officers, 1 warrant officer, 50 sergeants, 16 drummers and 910 other ranks. For list of officers accompanying the Battalion, click here. Field-Marshall Lord Kitchener’s 1914 address to the troops was a statement of honour and character; it was about staying true to the British character. It was, and still is, a simple yet profound speech that should have reached, as well as been upheld, by every soldier in the British Army. Men from the Regiment would have read this and in every respect prove themselves to uphold the words contained within it. A brigade of Fusiliers Marins, totalling 53,000 men. Given the gravity of the fighting taking place in the main theatre of war, this figure was all that could be spared. This was a sizable number of men but would it be enough to hold off the attacks before further British and French relieving forces arrived? The Minneapolis was the first to arrive at Zeebrügge, the men of the left wing of the 2nd Battalion Border Regiment disembarking and swiftly entraining to Bruges from where they marched to St. André, billeting for the night. One officer of the Battalion wrote: "We had to picquet the roads. The Gordon Highlanders held an outpost line in front of us....The people are very good to our men, but would take all their cap and collar badges, a great nuisance afterwards, as it was impossible to tell and man’s unit when he fell out". The right wing of the Battalion caught up at about 5pm on the 7th October after the left wing had been at St. André all day. Ghent was the 2nd Battalion’s next destination. They set off the next day on the 8th at about 9.30am firstly for Ostend via Leffingherm, marching as rearguard to the Brigade, then entraining for Ghent thereafter. They arrived at their destination on the morning of the 10th soon to be on the move yet again for Destelberghem where they eventually took up a line of outposts facing east. The three Companies ‘B’, ‘C’ and ‘D’ where situated on the outposts, meanwhile ‘A’ Company remained in reserve in the village. The 2nd Battalion were lucky enough not to be fired upon unlike the French Marines who, facing south, were engaged in fighting for some time. During this time large numbers of German forces were moving north. A day later on the 11th, the 2nd Battalion were ready to hand over the trenches they had been busy working on to the French Marines. They were on the move again by forced march to Somerghem, somehow getting lost along the way because the guide lost his bearings so much to their annoyance they did not arrive until the early hours on the morning of the 12th. They didn’t have much time to rest, a few hours maybe before they continued their march to Thielt where they arrived after dark taking in billets as their accommodation for the evening. The heavy continuous marching would have made even the fittest men in need of much deserved rest. Their route was not yet over. They struggled on mile after mile until they reached Roulers and then Ypres and finally Zillebecke by midday on the 15th; they had been on the move for the better part of a week. They hadn’t been in any close combat during their march until now. Battalion scouts under the command of Lieutenant Lamb encountered German Uhlans patrolling the area whilst searching for wood. A fire-fight ensued for a short while killing eight of the enemy and wounding one officer and one other rank. The wounded men were taken prisoner. The 2nd Battalion scouts were lucky as they suffered no casualties at that time. One unfortunate incident, however, did happen whilst Lieutenant Egerton was inspecting an advanced post. Fog surrounded the entire area they were occupying, therefore making visibility difficult at the best of times. On his way back from the inspection he was shot by one his own sentries, a mistake that anyone could have made given the circumstances. There was little they could for him and shortly after he died in Ypres. He had been the adjutant of the 1st Battalion for three years. The entire Brigade marched to Zandvoorde on the 16th. Here they billeted for a while before essential entrenching took place owing to the information received that they would be expecting heavy shell fire. The 2nd Battalion at this time were in support to the 2nd Battalion Scots Guards. On the 18th the Battalion marched to Kruiseik, arriving at 5pm and then on to Menin, advancing in artillery formation along with the entire Brigade the following day. Menin was occupied by the enemy and hostile shrapnel fire ensued for a while wounding 2 men of the Battalion. By 3pm they were entrenching at their fall-back position of Kruiseik Hill. The 2nd Battalion had an impossible task of covering 2¼ miles of trench systems along a front that needed some completion work doing to make them secure. It was going to be evident that not all companies, platoons and sections would successfully connect in the trenches but the best of an imperfect situation was put into action and so the Battalion was distributed as such: ‘B’ Company far left, ‘A’ and ‘C’ Company centre and far right taken up by 2 platoons of ‘D’ Company; 600 yards behind the front was the remainder of ‘D’ Company in reserve. It wasn’t long before the enemy were seen advancing in large numbers coming from the east about 800 yards distant. By night fresh orders were received that "trenches were to be held at all costs". The surprising factor here was that other than the two platoons of Border Regiment men, there were no other reserves for the Brigade and it was at this location, Kruiseik Hill, that the Brigade remained for better part of a week, holding on as best they possibly could. The 2nd Battalion were surrounded in their trenches on three sides by the enemy and as a result suffered more than the other three battalions of the Brigade simply because of their location. The enemy artillery persisted, and the guns on the America Ridge, roughly one mile south-east of their position, were particularly to blame. Snipers were troublesome as they could close in undetected to within a range of 300 yards. This, along with the impossibility of movement during the day meant that supplies could only be brought in during the night under the cover of darkness. Communication also caused problems as there were no telephone lines between the front line and Headquarters, which meant that all communication were dealt with by runners. The difficult circumstances didn’t show any signs of getting better when the men endured four days of bombardment on their trenches. The heavy shelling, up to 150 per hour, caused a serious amount of damage; the trenches had suffered terribly not to mention a string of small, focussed attacks intermittent between machine gun fire on the parapets. Each and every attack was repulsed. As Wylly describes "On the night of the 24th – 25th the Battalion machine-gun section was blown out of its trench, one gun being buried, and the detachment having to retire to a second position; but next night, Lieutenant Watson, who with his men did splendid work throughout, returned, re-dug and reoccupied his first position, and early on the 26th, seeing the enemy advancing in large numbers, he advanced his machine gun to a position in a hedge running from the Headquarters trench to the village, and opening fire at 300 yards did satisfactory execution on the German Infantry". The German advance on the night of 25th – 26th was almost a complete success. They had advanced to a point of taking the British front line trenches that were occupied by ‘A’ and ‘B’ Companies. The attack, which started at about 9am, was repulsed when survivors of these companies fell back joining men of the Scouts and Battalion Headquarters. Both Lieutenant Lamb, of the Scouts, and Lieutenant Watson of The Border Regiment, along with other ranks from Battalion Headquarters were able to hold their positions. It would be nightfall before they’d be relieved. The 2nd Battalion fell back to Zandvoorde where they took up the safety of a bivouack in a nearby field while ‘C’ Company had to march to Ypres where they billeted. On the 27th the Battalions new destination would be that of Zonnebecke. The Kaiser was handing out assurances to his men stressing the importance of how continued attacks to wear the enemy down will be the deciding factor on winning the battle Ypres and ultimately the war. It was at this time that the 2nd Battalion’s involvements become part of the "epoch-making operations". The Battalion had been reduced in strength after the fighting that taken place over the previous few days. Their numbers only consisting of 12 officers and 538 other ranks, were on the 29th, sent orders to immediately support the Gordon Highlanders who were at that time being heavily attacked. En-route they were caught in hostile artillery and machine gun fire and for at least hour could not move from their present position. When a window of opportunity presented itself, the Battalion continued on only for Lieutenant-Colonel Wood to be hit almost instantly, Captain Molynuex-Seel was hit twice by machine gun fire from a masked post in a nearby house and Captain Warren too became wounded leaving Captain Askew to take command of the Battalion. An officer who was present at the time writes "We advanced up the hill into Gheluvelt village and held on to the top for over an hour before we were reinforced. The Colonel was hit early in the leg and got back safely. We then advanced on the N. slope of the hill through the village. I saw the German reinforcements coming along the Menin Road in fours about 1,200 yards away, so I got the machine guns across a ploughed field into some turnips and opened fire. One gun got hit almost at once and was ‘hors de combat’, but the other escaped owing to our changing position our position every few minutes. The enemy broke off the road and lay in a ditch, which we opened on again until they were seen retiring and our ammunition supply was exhausted. We had no limber and could only carry about 12 boxes of ammunition. I got the guns back to sunken road in the rear and found Captain Warren and Lieutenant Simon Fraser of the Gordons sitting there. I was sitting between Fraser and a lance-corporal of ours when a shell burst killing them both instantaneously; two of my team were wounded slightly. I then met Major Cator and the Brigadier, who told me to tell our companies in front to retire at dusk, as the 1st Corps were then once more in their own position". Captain N.F. Jenkins (rank of Major in photo), 3rd Battalion's commanding officer during three days recouping in woods near Ypres. On the 30th the Battalion spent most of the day in some woods north-west of a château near Zonnebecke. Their orders were to move to the east of Hooge and then on the 31st, to Klein Zillebecke. A new month saw no change to their situation. They were heavily bombarded on the 1st November but later on in the morning were able to retaliate by playing on the enemy’s ignorance; a German battalion was seen crossing open ground between two woods and judging from their unawareness of the close proximity of The Border Regiment’s position in their entrenchments, Lieutenant Lamb, along with his scouts and Lieutenant Watson and his machine gun took the opportunity to hand and opened fire on the enemy’s open location. This was not without some form of further retaliation and three hours later German persistence had eventually hit the area surrounding the machine gun, killing several men in the process. It was too dangerous for the men to stay so they fell back out of danger and there remained until they deemed it safe enough to go back and retrieve the machine gun under the cover of night. The Battalion, on the 2nd November, began making up positions to ensure a continuous line was formed on their front at the extreme right of the 20th Brigade. Enemy movement had been spotted and then 10am continuous hostile shelling started and continued for a duration of no less than five hours. The Battalion had been through a beating; the one remaining working gun the Battalion had was victim to the violent shelling and had been destroyed wounding five men and killing one from the detachment. The gun fire eased only to be heard by bugles, which meant one thing, the Germans were about to attack. The 2nd Battalion waited and held their fire until the right moment presented itself to the point when the "Germans were almost on top of them, and then opened with tremendous effect, the assailants being mowed down in swathes. The enemy fell back to the shelter of the woods and then, after a brief interval the bugles sounded once more and the attack was pressed, and again was there the same slaughter". This carnage took many German lives reducing the enemy’s Battalion by numbers. In a time of war orders had to be followed but little did either side know how long and how bloody this war was going to become; it had only just started and the Great War, though in its early days, had built a harrowing reputation, but an attack like this was just one of many more to come in the proceeding years. The fighting here continued when Sergeant Booth of the Battalion noticed and open flank and upon seeing this he "left his trench under heavy fire and with great gallantry brought up two sections from the reserve, reoccupied the vacated trenched and kept the line intact until three hours later reinforcements came up". The Battalion, later that night after bitter fighting, took up temporary residence at Brigade Reserve in the woods near Ypres after they had been relieved by the Gordon Highlanders. 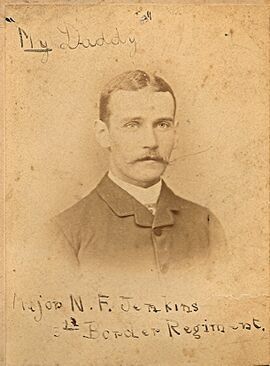 Here they remained for three days recouping their ranks with a further 98 non-commissioned officers and men under the command of the 3rd Battalion, The Border Regiment’s Captain N. F. Jenkins. The entire Brigade was again on the move, this time marching by night to Locre during continuous outbursts of shelling as they passed through Ypres. Luck would have it that not a single man was harmed on their journey, something quite unusual considering the logistics of moving that many men at a time of artillery fire. They reached Locre early the next day on the 6th and rested in an open field until later in the morning. The fighting over the last few days had taken its toll on the 7th Division and numbers had been greatly reduced; the Border Regiment had been hit hard. Figures of casualties of the 2nd Battalion, Border Regiment between the 18th of October and 7th of November can be seen in the table to the right. To see table of the officers who became casualties between 18th October and 7th November, 1914, click here. The 2nd Battalion and everything it had been through since arriving in Belgium had not gone unnoticed. Fierce action had thrown the men into battles of which the likes they had never before seen and taking on board what they had learned in the time they were there was a real challenge; something they had overcome but at a price. On the 3rd of November the G.O.C. of the 7th Division sent a message of recognition to the Commanding Officer stating that "Stout action of The Border Regiment in maintaining its trenches throughout the day, although unsupported on its right, is much commended. Congratulate Border Regiment from me and tell them I am making a special report on their conduct through Corps Headquarters". Then, concerning the Brigade, the following messages were received stating how well the Brigade had accomplished the almost impossible task it was charged with during the operation at Ypres. "The G.O.C. has had great pleasure in forwarding to Headquarters, IVth Army Corps, a despatch testifying to the devoted conduct of the Officers and Men of the Brigade under your command", in this case Brigadier-General H. G. Guggles-Brise, "during the recent operations near Ypres. He hopes you will take occasion to bring his remarks to the notice of the Officers Commanding Battalions concerned". "20th Infantry Brigade. This Brigade had eventually the most difficult task to perform as it had to hold the exposed position at Kruiseik Hill. It was impossible to abandon this point without prejudicing not only the rest of the line, but also the pivot of all contemplated offensive action. In spite, therefore, of the natural unfavourable situation Kruiseik Hill had to be held. The 20th Brigade did this itself under constant violent artillery fire by day and often by night. The defence was by no means passive, but counter attacks were frequently and successfully made. Later on in the fighting this Brigade showed the same tenacity in defence and on one critical occasion (31st October) by its forward action was mainly instrumental in restoring the fight. The losses of this Brigade were very heavy". "2nd Battalion Border Regiment. This Battalion held a portion of the Kruiseik position in front of Ypres during which it was exposed to particularly heavy shell fire for 3 days and nights. Many of the trenches were blown in, but no trench was given up by any portion of this Battalion. On 2nd November this Battalion formed the right of the Brigade at Veldhoek. Owing to troops on the right giving way the enemy was able to occupy some woods and so surrounding the right of The Border Regiment. Nevertheless the Battalion held its line for some hours until the enemy could be driven from these woods by relieving troops. During the fighting this Battalion lost very heavily. The devoted and firm conduct of this Battalion repeatedly called forth the admiration of the Brigadier and of officers in other battalions in the same brigade; and I, myself, can testify to its fortitude and determination to maintain its position at all cost; a spirit which saved a difficult and critical situation. It is impossible to praise this Battalion too highly for its firmness and battle discipline". Many men from the 7th Division lost theirs lives. Of the 400 officers and 12,000 other ranks that set sail from England only 44 officers and 2,336 other ranks remained. The Division as a whole endured bitter fighting from a force far stronger than their own and "here they clung on like grim death, with almost every man in the trenches, holding a line which of necessity was a great deal too long". These words, written by the hand of General Rawlinson, Commander of IVth Corps spoke of bravery and how well the men had coped under such difficult circumstances. He continued by saying "The odds against them were about eight to one; and when once the enemy found the range of a trench, the shells dropped into it from one end to the other with terrible effect. Yet the men stood firm and defended Ypres in such a manner that a German officer afterwards described their action as a brilliant feat of arms, and said that they were under the impression that there had been four British army corps against them at this point". There was no denying that the men of the Division did their part to the best of their abilities in such appalling conditions under violent and hellish fire-fights and hand to hand combat. Their reward: congratulatory messages and the chance to fight again another day. For some, maybe this was enough; the heartfelt satisfaction of one small victory to recharge the men’s battered and bruised spirits. To others the war had only just begun and all they were thinking of was home. For those of the 2nd Battalion, who were lucky enough not to be killed or wounded, were on the move again. For roughly ten days the Battalion marched from Locre to Meteren, then on to Bac St. Maur and eventually into Sailly towards the latter part of the November. It wasn’t until 1st December, 1914 that the Battalion resembled something akin to full war strength after several drafts of officers and men joined the service and companies. Captain C. Lamb had been decorated personally with the D.S.O. by His Majesty the King for gallantry in action at Kruiseik. Almost three weeks later, the Battalion was involved in an unsuccessful attack of German trenches opposite their current position. Captain Warren led ‘A’ and ‘B’ Companies of the Battalion and two companies of the Scots Guards commencing at 6.15pm across No Man’s Land, reaching the enemy trenches with heavy casualties, unfortunately not only from the German guns but also from our own. As a result, the attacking companies drew back 50 yards or so at which point they laid down and awaited further instruction. Orders were received about an hour later to push on and recommence the attack. The attack again not successful and the men withdrew back to The Border Regiment’s trenches where they again awaited further instruction. The Brigadier, who originally gave the order for the attack, saw with forethought that too many lives would be lost and so the operation was abandoned. Captain Warren and the men were outnumbered. With the enemy machine-gunners waiting for their movements after the initial attempt failed, the element of surprise had gone and it became evident that a successful outcome of this attack was slim at best. Captains H. A. Askew and C. Lamb, D.S.O. were killed or dying of wounds in the process, the former actually making it into German trenches. They couldn’t afford to waste more lives and so did the right thing by calling it off. Lieutenant M. N. S. Kennedy and Second-Lieutenant N. Castle were wounded and the total loss of other ranks came to 110. "10694 Private Abraham Acton, 2nd Battalion The Border Regiment. 6423 Private James Smith, 3rd Battalion The Border Regiment (attached to 2nd Battalion) For conspicuous bravery on 21st December, at Rouges Bancs, in voluntarily going from their trench and rescuing a wounded man who had been lying exposed against the enemy’s trenches for 75 hours, and on the same day again leaving their trenches voluntarily, under heavy fire, to bring into cover another wounded man. They were under fire for 60 minutes whilst conveying the wounded men into safety". Captain Lamb’s body was also retrieved by two men, Lance-Corporal Brewer and Private Clarke, who were awarded the Distinguished Conduct Medal and further to the acknowledgement of Captain Askew, his cap and badge were returned with a note saying that they had buried him and erected a cross to the memory of "a very brave British Soldier". On the 22nd Captain Warren was sent home sick and on Christmas Day Captain S. H. Worrall, of the 1st Battalion Border Regiment, joined the 2nd Battalion and took over command as a further draft of 130 non-commissioned officers and men arrived. Later in the morning, ‘A’ and ‘B’ Companies of the Battalion who were still holding the front line, received a message from the enemy who had signalled they wished to speak to an officer in agreeing to an armistice. Both sides agreed upon a cease-fire, and in honour of that agreement put down their arms and spent the festive day burying their dead who had been lying out there, cold to the elements since the 18th October. Family and friends sent telegrams to the men who were facing a bitter winter in the trenches. It might have been Christmas but it would be a moment they would never forget, far from home with only their comrades for support in harsh and unrelenting times. Their Majesties the King and Queen gave their best wishes to every officer and man of the Army and the Commander of the B.E.F. in conveying his greetings said "In offering to the Army in France my earnest and most heartfelt good wishes for Christmas and the New Year, I am anxious once more to express the admiration I feel for the valour and endurance they have displayed throughout the campaign, and to assure them that to have commanded such magnificent troops in the field will be the proudest remembrance of my life". It is here that The Border Regiment’s involvement in the war of 1914 comes to an end. In the few months on Belgian soil they had seen many of their friends and comrades die in battle, had spent many days and weeks marching back and forth, training and entrenching, fighting and resting. A new and challenging year for the men would reveal itself in just a few short days; the war far from over was only just beginning. If there was such a thing as hell on earth, then this was it, and it was only going to get worse. ↑ There are many references to this text contained in this site's pages; where an instance is used the reference, for example, (Wylly, p.81) is given. Other instances may be directly quoting Wylly using his name as a reference for that quote in the main body of text. ↑ Wylly used many references from the war diaries of each of the battalions, in many cases quoting them directly. If anything does not exactly fit then is probably due to a little creativity. ↑ This history is very much in its infancy is being written in my own time, therefore, you may notice individual Battalion's pages still quite empty. It will take time to write a history for all battalions so please bear with me. ↑ Each Battalion that served in any theatre of war during the war will have its own history on its respective pages. ↑ Colonel H.C. Wylly, C.B. (1925). The Border Regiment in the Great War. Gale & Polden Ltd. ISBN 1847342728. p.3-4. ↑ The World Crisis, vol i, p. 332. ↑ Colonel H.C. Wylly, C.B. (1925). The Border Regiment in the Great War. Gale & Polden Ltd. ISBN 1847342728. p.5. ↑ Originally Polish light cavalry soldiers armed with lances, sabres, pistols, rifles; troops like these existed in European armies, including Germany. ↑ Colonel H.C. Wylly, C.B. (1925). The Border Regiment in the Great War. Gale & Polden Ltd. ISBN 1847342728. p.9. ↑ 19.0 19.1 Colonel H.C. Wylly, C.B. (1925). The Border Regiment in the Great War. Gale & Polden Ltd. ISBN 1847342728. p.11. ↑ 21.0 21.1 Colonel H.C. Wylly, C.B. (1925). The Border Regiment in the Great War. Gale & Polden Ltd. ISBN 1847342728. p.12. ↑ Colonel H.C. Wylly, C.B. (1925). The Border Regiment in the Great War. Gale & Polden Ltd. ISBN 1847342728. p.12-13. ↑ Colonel H.C. Wylly, C.B. (1925). The Border Regiment in the Great War. Gale & Polden Ltd. ISBN 1847342728. p.13.